Impressively paced and superbly shot, this is a powerful and ultimately terrifying drama with stunning sound design work and an Oscar-worthy performance from Robert Redford. Written and directed by JC Chandor (who made Margin Call), All is Lost begins with an unnamed (the credits call him “Our Man”) yachtsman (Robert Redford) in the middle of the Indian Ocean who wakes up to discover that water is pouring into his boat. He quickly discovers that his yacht has collided with a floating metal container and that the hull is substantially damaged. Seemingly unconcerned, he sets about patching up the hull, bails out the excess water and continues on his way. However, with a fierce storm fast approaching, Our Man's problems are far from over. 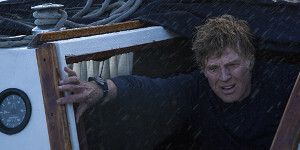 Robert Redford is terrific as the lone, experienced sailor battling both the elements and some monumental bad luck. It's an intensely physical, almost entirely dialogue-free performance (he has maybe five lines in the whole thing) and Redford looks suitably rugged and weather-beaten throughout, right down to the callouses on his hands and the salt-spray on his wind-battered face. The sound design of the film is simply astonishing – if you closed your eyes you could be right there on the boat with Redford, surrounded by creaking ropes, water knocking against the hull, twanging stays, flapping sails and howling winds at all times. The effect of this is completely immersive, allowing Chandor to crank up the tension to a high degree as you will Our Man to somehow defy the odds and make it to safety. There's an appealing simplicity to Chandor's script that works brilliantly (you can imagine the five word pitch to the studio: Robert Redford's Boat Is Sinking), stripping the story right down to a thrilling and suspenseful story of one man's visceral battle for survival. That said, the film can't resist a spot of heavy-handed symbolism – when Redford's plight goes unnoticed by a giant ship (the same kind that dropped the container in the first place), it's hard not to see it as a metaphor for the little guy being shafted/ignored by big business (amusingly, the company, Maersk, is the same company Captain Phillips works for in Captain Phillips). All is Lost is a powerful, intense and gripping survival drama with stunning sound design work and a strikingly physical, award-worthy performance from Robert Redford. Highly recommended.